Vacation rental house. 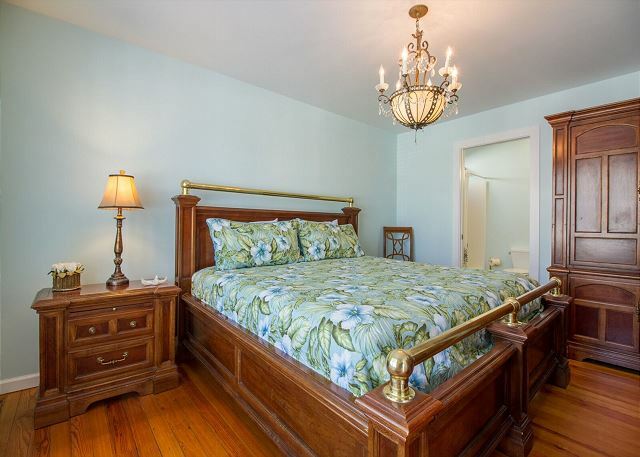 Sleeps 14, 7 bedrooms, 4 bathrooms. No pets allowed. Welcome to Sea Grass -- Enjoy you're very own private sun deck and plunge pool added in 2016! This is a great traditional style beach house and your family will appreciate the space to spread out but feel close at the same time. An upgraded kitchen for breakfast, lunch and dinner -- you can plan your meals for family time. 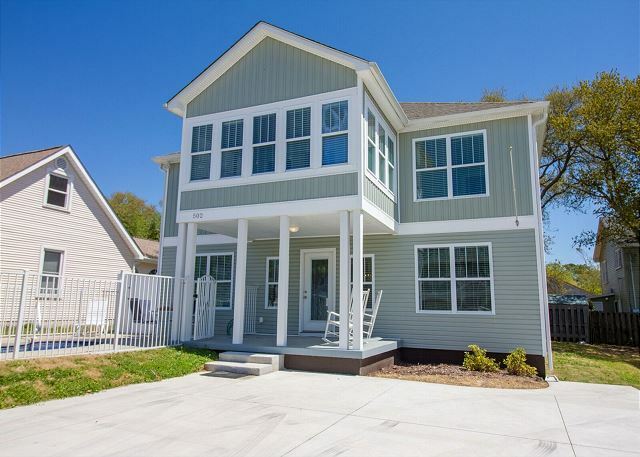 This house is well taken care of and your family will appreciate the attention to details. An upgraded and modern kitchen for eat -in or take-out. Downstairs dining table seats six and there is a smaller table upstairs that seats four. Morning coffee or afternoon happy hour by the pool -- your choice. 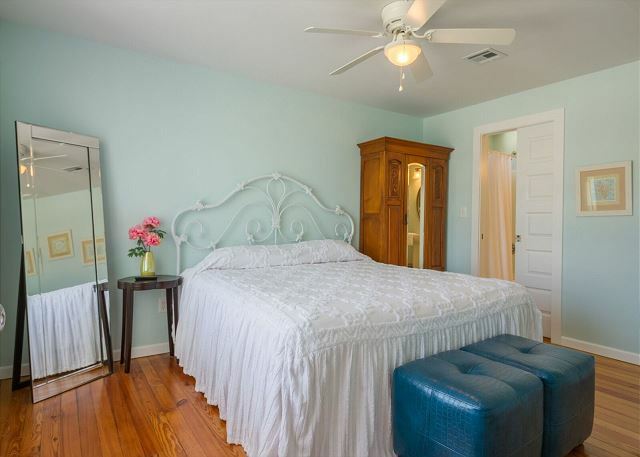 Nice, bright king bed in the master. Views to the pool outside. 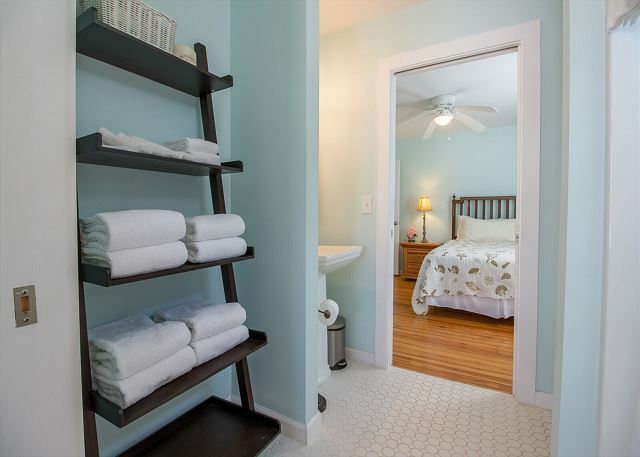 Master bath -- towels and bed linens provided for the entire house during your stay. 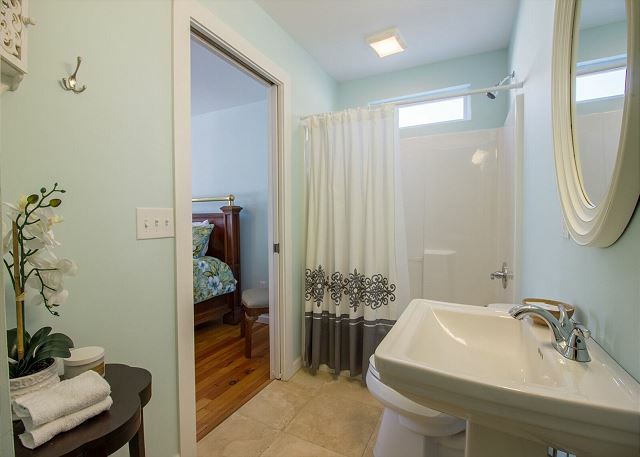 Spacious master bath with tub and shower combo. Downstairs guest room with queen bed. Flat screen tv in the downstairs guest with queen bed. 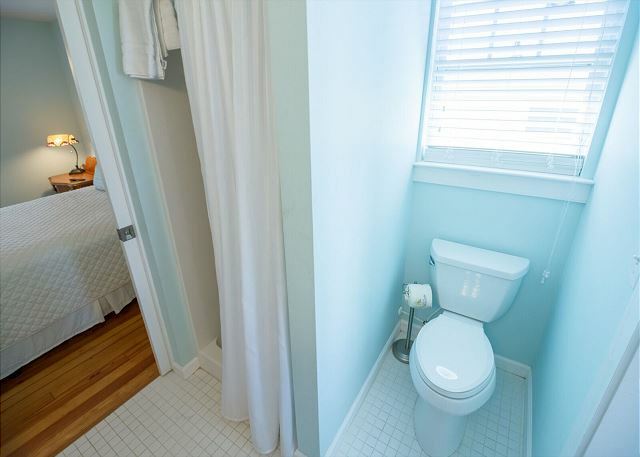 Bright and spacious bath shared by two guest rooms. 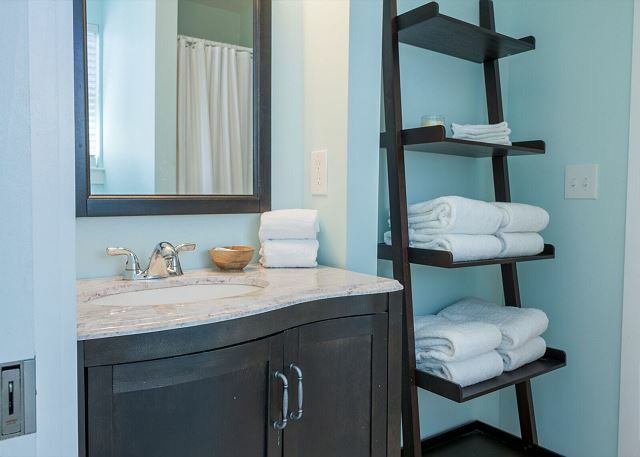 Your bed and bath linens are stocked and ready for your visit. 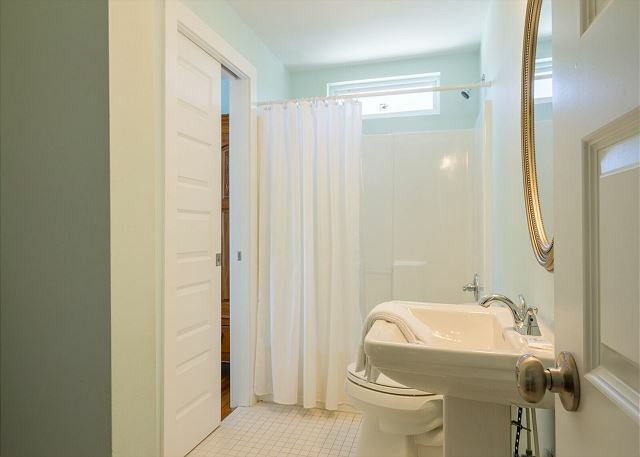 One of three shared bathrooms. Tub and shower combo in this one. All bed and bath linens provided. Downstairs guest room -- flat screen tv included. 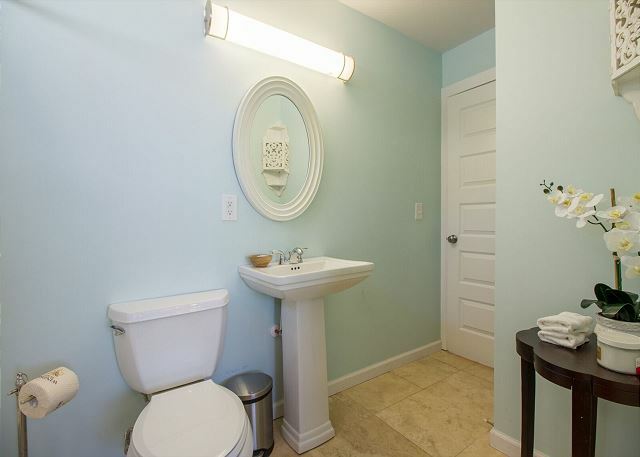 Jack-and-jill bathroom shared by two of the upstairs guest rooms -- both with queen beds. 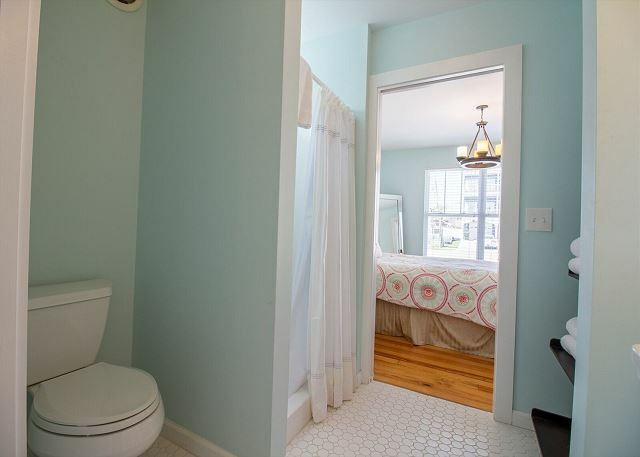 Another shared guest bathroom. 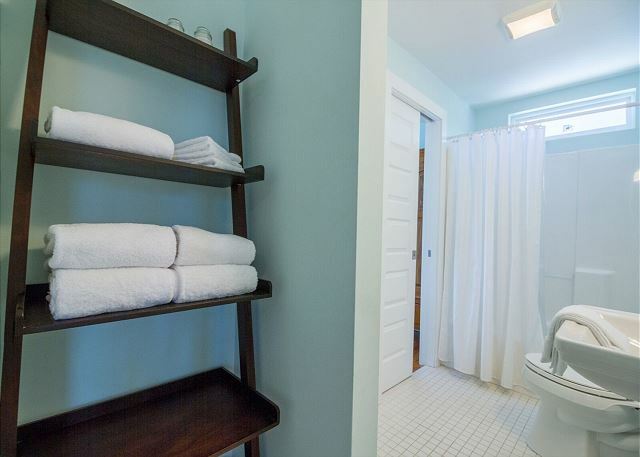 Well stocked with towels during your stay. 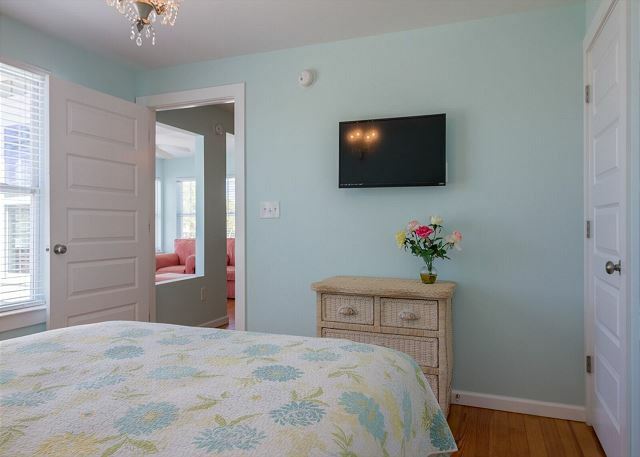 Upstairs guest room with queen bed and flat screen tv. Bright but cozy. Flat screen tv in the upstairs guest room. Upstairs king bed in guest room with shared bath. Upstairs shared bath with tub-shower combo. 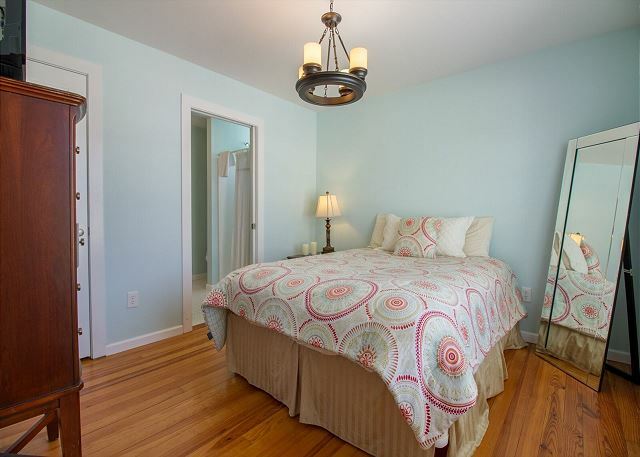 Upstairs guest room with queen bed. Washer and dryer are tucked into this room too. Upstairs guest room has a private walk out balcony. Enjoy the tree top views. 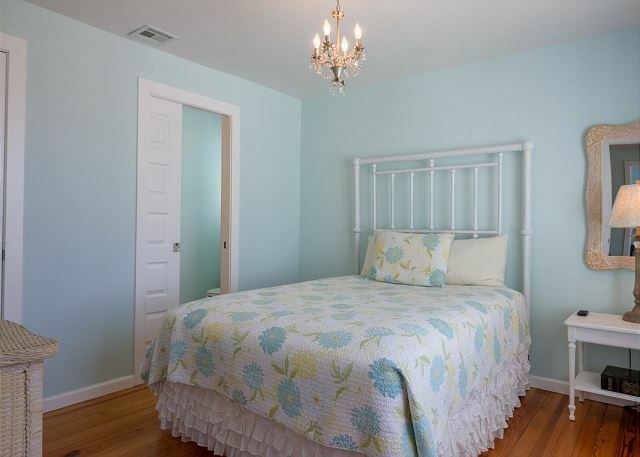 Guest room with queen bed. Family gathering room upstairs. Enjoy a game night or movie night together. 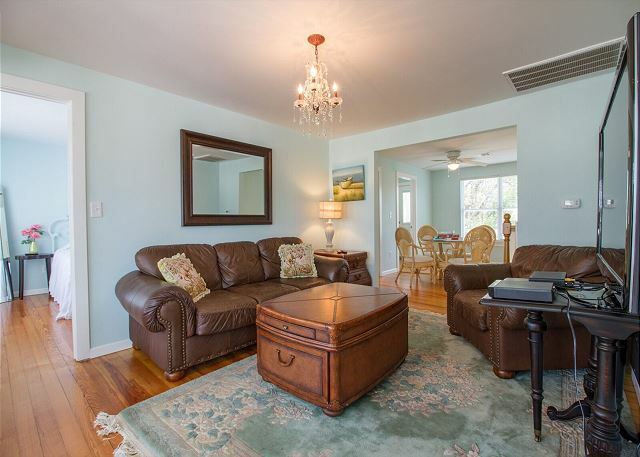 Plenty of room for the family to spread out and entertain themselves. Enjoy the wide screen tv for movie night. Childrens table for dinner or game night gatherings. 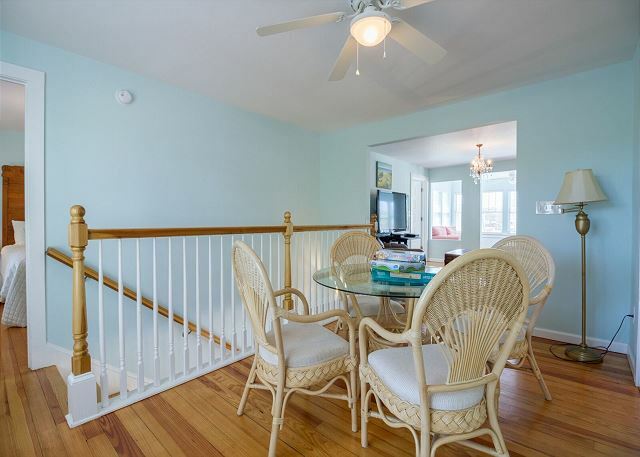 A great family space to enjoy your beach memories for years to come. A nice sunny deck to enjoy the outdoors and shower after the beach. Coffee or happy hour on the back deck. 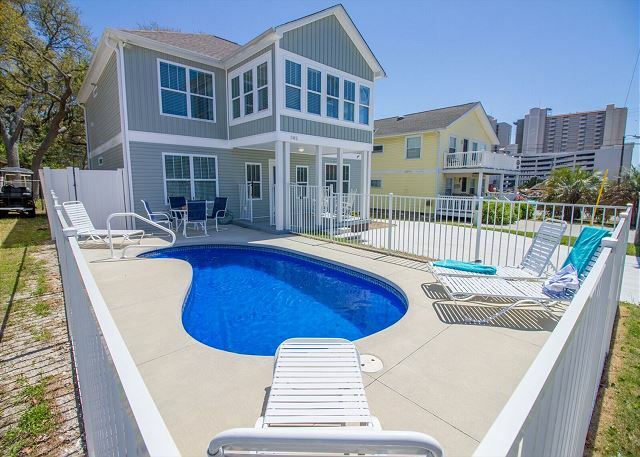 Sea Grass is a charming private house for your family to enjoy a beach getaway. This public beach access has showers, bathrooms and handicapped beach walkover. 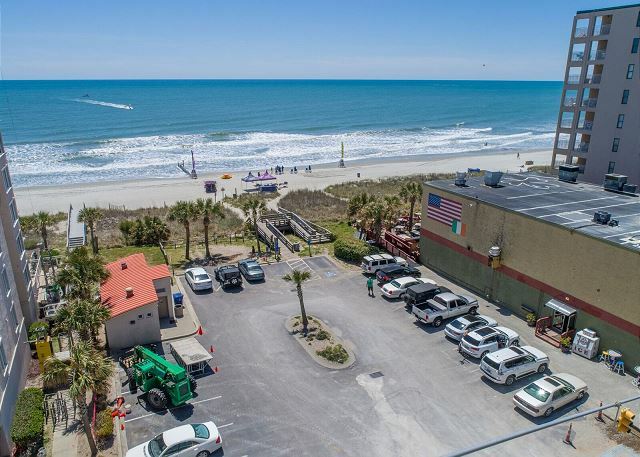 The building to the right is a great little beachside grill for burgers on the deck or happy hour cool drinks. You can see that the house is just to the left with the bright blue pool and the beach access is just the 3 blocks down the sidewalk. 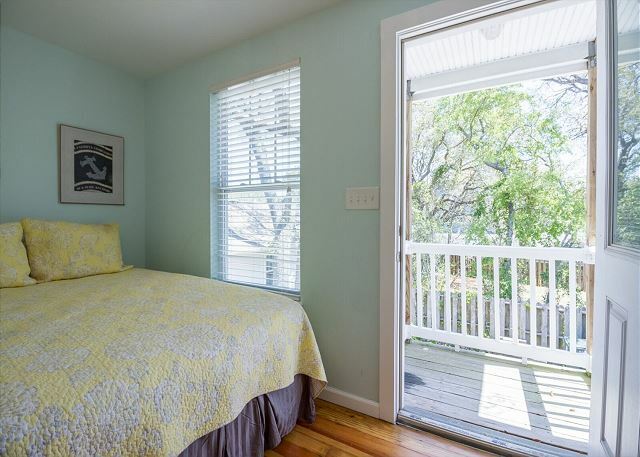 Your stay at this charming beach home will include bed and bath linens, with beds freshly made upon arrival and departure cleaning included, too. 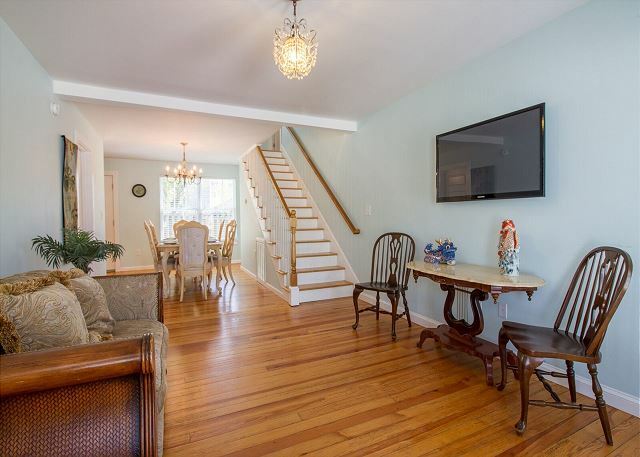 The perfect setting for your family reunion and other gatherings; it's located only 2 short blocks to the beautiful Atlantic Ocean. An ice cream and hot dog stand with sidewalk seating just on the next corner, a giant beach store, and Molly Darcy's Irish Pub for lunch or happy hour on the ocean front sun deck, all just a block away. Great family reunion or group space with a small private pool to dip when you have had enough of the sand. Parking for 4 vehicles but may be tight if all are large SUV type. The city does offer a dozen or so local "street" parking spaces within the immediate block area, but none of these can be guaranteed, because it's first come first serve basis for beach goers. 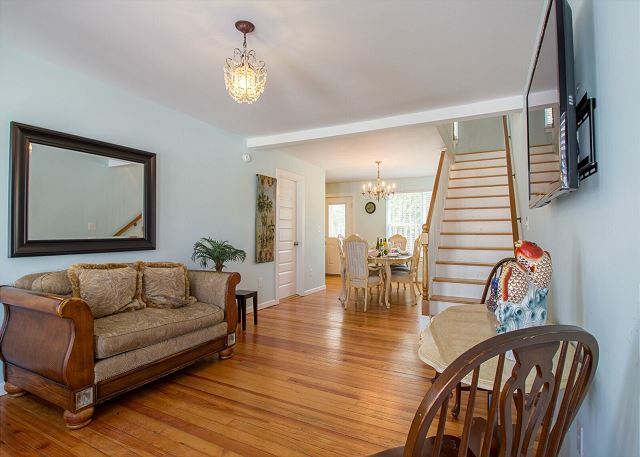 UPDATES: This home has been TOTALLY REMODELED from the walls in and out! New siding, new drywall, flooring, furniture, kitchen, bath rooms, everything is NEW!!! And a private pool added in 2017! 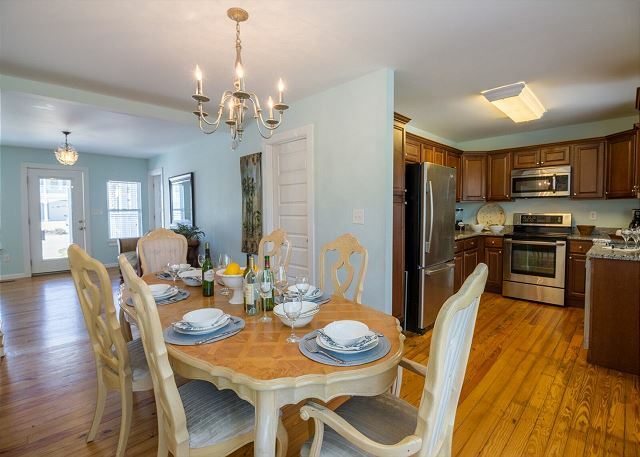 KITCHEN: All granite, new cabinets top of the line cookware, full-sized appliances, and abundant dishware for cooking a great dinner at the beach. A few miles South is Barefoot Landing with over 60, specialty shops, beach stores, restaurants and attractions for the whole family to enjoy. Stroll thru this beautifully landscaped complex, and shop for jewelry, clothing, accessories, lots of beach items, and more! The Alabama Theater offers live theater productions every day of the week (in season), with talent nothing short of Broadway! The Carolina Opry, and Pirates Voyage, also has great family oriented shows. 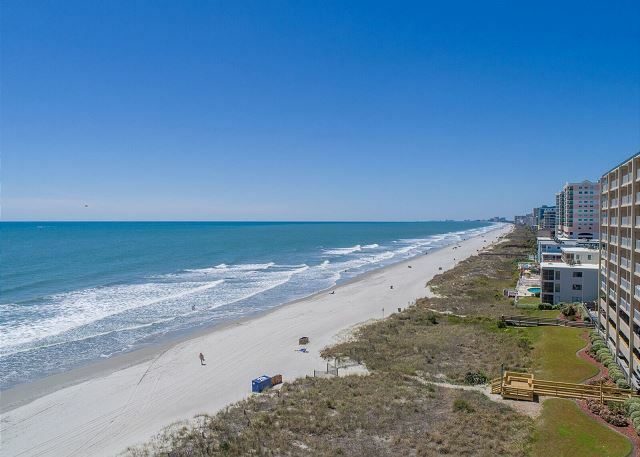 A short 20 minute drive to Myrtle Beach offers Broadway at the Beach, our answer to a Boardwalk. This huge area offers places to shop, eat, celebrate & play. Shop till you drop or just enjoy the rides and attractions in this huge area, devoted to fun. There are over 35 great restaurants including: Hard Rock Cafe, Paula Deens Family Restaurant, Wahlburgers, Dave & Busters, Jimmy Buffet's Margaritaville, Johnny Rockets, Key West Grill, King Kong Sushi, Landry's Seafood, and Joe's Crab Shack. AMAZING!! Definitely a spot I plan on visiting again. Very clean house. Great service from the owner. Just a really awesome experience with this terrific property! 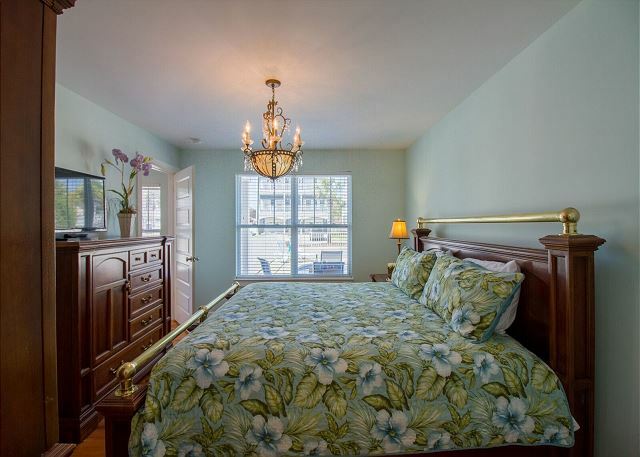 Thank you for the outstanding review about this great private home, fondly dubbed "Sea Grass" by the owner. 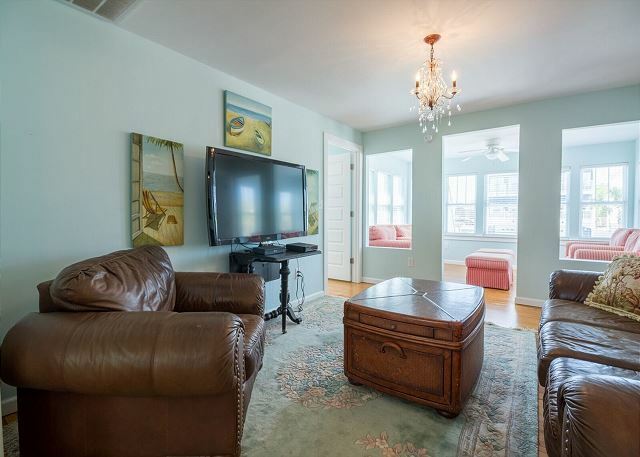 It is a true beach beauty that offers families and groups room to enjoy time together, whether relaxing poolside or beachside during the day, then cooking out or movie night together in the evenings. The public beach access is just two blocks away with bathrooms and showers. 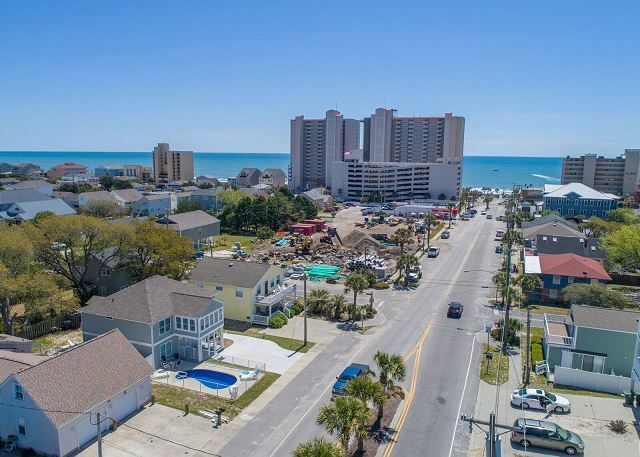 Within the immediate area there is something to entertain everyone -- an ice cream and hot dog shop on the corner, a giant tacky beach shop for those fun souvenir searches and a laid back beach side cafe for lunch or happy hour by the sea. We appreciate your positive feedback so that others might learn what a perfect getaway destination can be found at Sea Grass. The location of this house was very convenient to the beach. The onsite pool was convenient and in the sun for the entire afternoon. The upstairs gathering area was spacious, and the front porch and back deck allowed everyone to spread out. Thank you for choosing to stay with us at the "Sea Grass" house. It is a special place for families to gather and celebrate the summer. The location is just three 2-3 blocks walk to the beach and the plunge pool is a refreshing added bonus when you have had enough of the sandy beach. We appreciate that you left a great review so that others might read what a great place this house is to consider. Thanks again. One of the best properties we have stayed at in NMB. 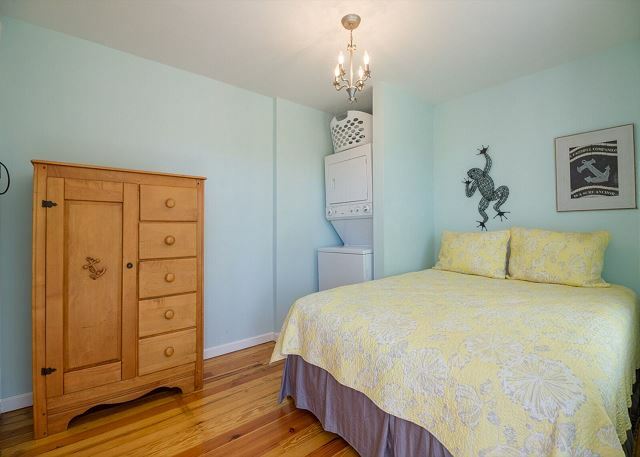 This property was in a great location, the set up was great for our family with queen and king beds. The pool was small but very nice to have. Overall a great vacation home. One of the best properties we have stayed at in NMB, what more can I say! 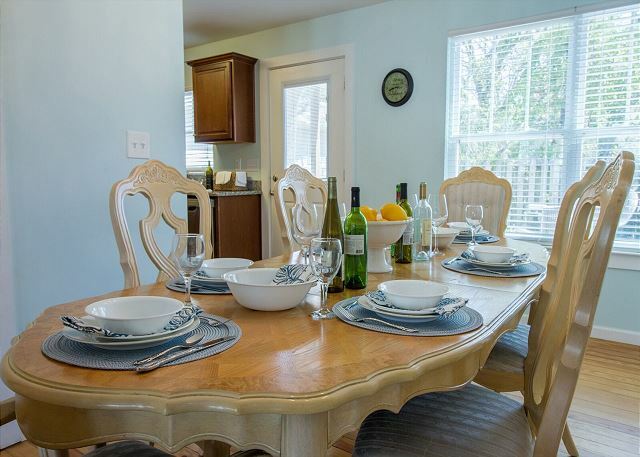 Sea Grass House is a charming beach home is the perfect setting for a family gathering. Just 2 short blocks to the ocean. 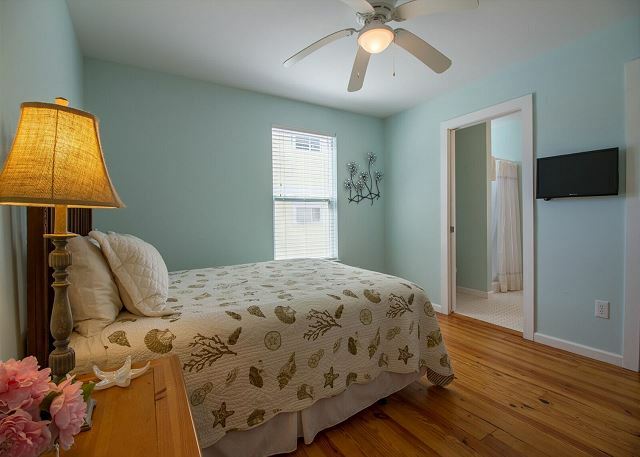 Near ice cream, burger shop, beach store & pub all within walking distance. The owner has put a lot of care and effort into his home to ensure that his guests enjoy their stay. Thank you so much for staying with us and we hope to see you again next year. An awesome house. We stayed for a week and it was awesome. The house looks a lot better in person. Very short walk to the beach made the stay even better. Very quit neighborhood. The kitchen sink fosset screw fell out the same day we got there and the Maintance team came right over. Awesome house, Maintance staff and property management.